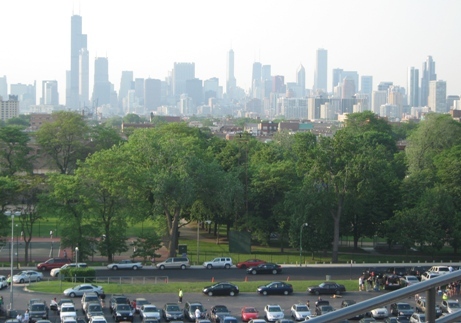 Here is a very important tip for Guaranteed Rate Field seating, especially if you want to explore the place: get a lower level or bleachers ticket. 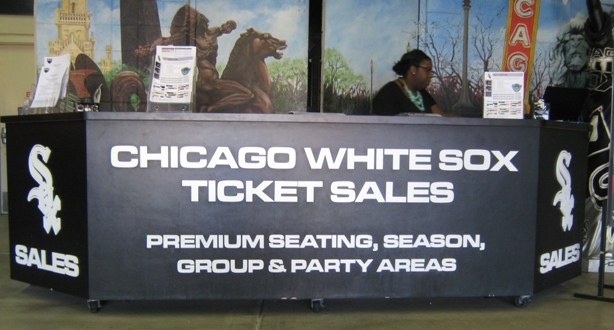 The White Sox do not allow upper deck patrons in the lower level of the ballpark, and the rule is strictly enforced. Well, most of the time, anyway. Not even the Rain Room? Rats! I don’t know the exact reason for this policy, which has been in place for some time now. From what I’ve read, the White Sox had trouble with upper deck patrons going out onto the field and attacking coaches and umpires, but that seems a pretty thin reason to enforce a policy that no other team has to my knowledge. My guess is that with the White Sox drawing about 20,000 a game or less, they would have troubles dealing with the occasional seat poacher and decided to free up their security for other potential problems. Lower level seats are more expensive than upper level seats, and the lower level has a much wider variety of concessions, souvenirs, photo-ops and other attractions, like the huge center field concourse. The upper level is just okay with its food selections, although they do have a Leinenkugel’s beer kiosk that sells some strange combinations of Leinie’s brews. 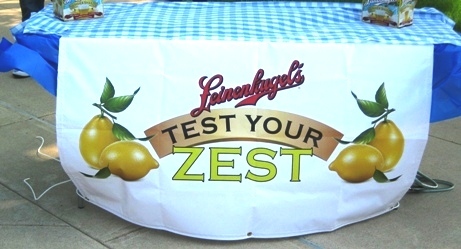 You’re not the first to think of lemon in beer, guys. Whatever Sox fans’ opinions about it, it is what it is, so it’s a key thing to remember. You don’t want to make a pilgrimage to a ballpark and miss most of it because of a restrictive policy that you’d never heard of. There are some ways to beat the system, though. Or at least try. The first is to simply try getting in at a gate that leads to the lower level. When the gates open and there are lines, chances are that the ticket scanner will simply let you through without bothering to check the ticket. I read this in a forum post from 2002, however, so I’m not sure whether that would work today. The White Sox may have updated their scanners to not allow this. Anyone got an extra ticket to the Skyline Club? Another method is to find someone you know who has a lower level ticket to the game, get a copy of it, and once you’re in the ballpark, use the copied lower level ticket to get into an area otherwise restricted to riffraff like you whenever an usher asks to see your ticket. This should work fine, but if you get confused and use the wrong ticket to get in, you risk personal injury that wouldn’t entirely be unjustified. Sometimes, in later innings, if you explain nicely to an usher that you are visiting and just want to see the Harold Baines statue, they might let you through. But obviously, this isn’t something you can count on. So really, sorry to say, the best option at Guaranteed Rate Field is to simply get a seat in the lower level; it’s a little easier now that the Sox offer cheap tickets in the outfield corners. There’s a lot to see, between the statues and the outfield concourse and the interactive games and such. Plus there is a much wider variety of food choices in the lower level, and there’s a lot of good grub here. Well at least this view is nice. The upper level has some perks—there’s a great view of the city from the ramps, a nice breeze on warm days, and murals of Sox history on the upper concourse walls. 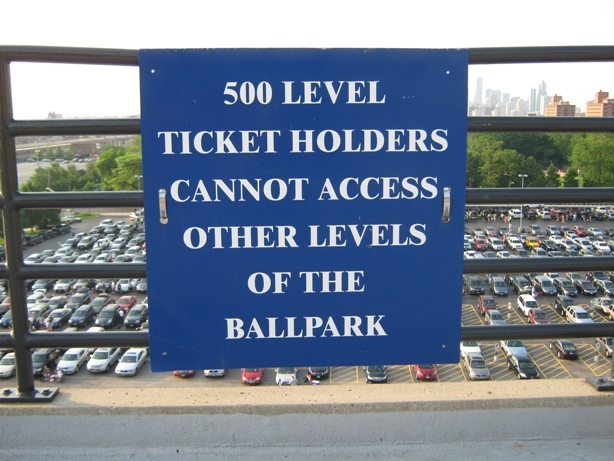 But honestly, between the nerve-wracking agitation from possibly the steepest upper deck in baseball and the limits of what can be accessed, I wouldn’t get an upper level seat unless I was just going to a game and didn’t care about seeing the ballpark. Many White Sox fans are perfectly fine with that. But you might not be if you had driven hundreds of miles to see the place. Better to know ahead of time what type of seat to get. Want to know more about Guaranteed Rate Field? Sign up here for my completely free Guaranteed Rate Field e-mail newsletter series, and score some seriously valuable info about tickets, seating, transportation and food…see you at the Yard! Where’s The Love For White Sox Fans? Enjoying the cool White Sox game tips? Sign up today for the absolutely free Ballpark E-Guides Guaranteed Rate Field newsletter!